We all know men – particularly straight men, particularly the breed of straight men that feel the need to exert their masculinity at the expense of others – say things that are sometimes ridiculous, sometimes stupid, and often both. The exaggerated behavior of performative masculinity is abundant: just look at the White House or, you know, any street. These physical and verbal characteristics, what some refer to as swagger, have now found their way onto the stage in the mouths and bodies of a group of people that are often the recipients of this unchecked bravado – women. Amy Staats’ Eddie and Dave, currently having its world premiere at Atlantic Stage 2, is a bio play about the rock band Van Halen, specifically the fraught relationship between its title characters, guitarist Eddie Van Halen and lead singer David Lee Roth. Eddie and Dave begins with the question, “What really happened with David Lee Roth at the 1996 MTV Video Music Awards?” and then jumps back to explain everything that lead up to that night. The story is familiar, even if you know nothing about Van Halen (guilty). Discord amongst band members has been depicted many, many times (Bohemian Rhapsody is currently nominated for Best Picture) and it would be tired territory, except Staats sparks it up by flipping the gender dynamic. In Eddie and Dave, the members of Van Halen are played by female actors and the only female character, TV star Valerie Bertinelli who was married to Eddie, is played by a male actor. The rock stars, these paragons of male sexual energy, are embodied by women in not-quite drag, lending a heightened nature to their words and actions. Staats’ dialogue lampoons the bro-babble of rich, entitled white men while also keeping the band in a loving embrace. 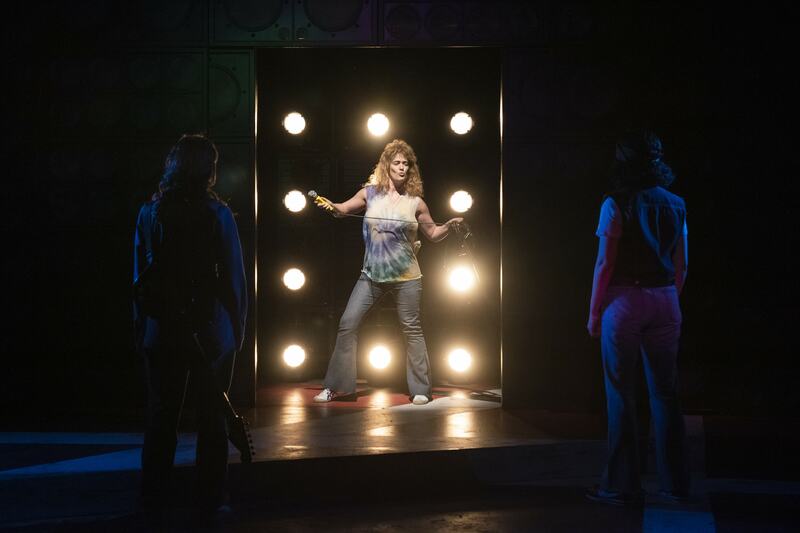 Megan Hill relishes David Lee Roth’s magnetism and creates a physicality that dominates the stage with energy and unabashed space-taking. As Eddie’s brother, Alex, Adina Verson is the peace-keeper, the go-between calming the two larger personalities on either side of him. Verson finds a wide-but-blank-eyed take on the elder Van Halen. This dude-fest, with all its foibles and eccentricities, is brought to life by a group of people prohibited from joining it – and this distancing brings it all into a sharper focus. The relationship between Eddie and Valerie Bertinelli is most effective at highlighting the gender imbalance in rock music narratives. As Bertinelli, Omer Abbas Salem is given the dialogue that is usually bestowed on the suffering wife stuck at home. Salem’s Bertinelli complains that Staats’ Van Halen works too much and doesn’t spend enough time with his family and Hill’s Roth warns that Bertinelli is going to cause a rift in the band. In Eddie and Dave, the Yoko figure is played by a man, upending the gender role the opposite way and illuminating the inane things women are given to say in movies and plays written by men. The playwright is clearly a Van Halen fan, as evinced in some heartfelt monologues delivered by an unnamed MTV VJ played by Vanessa Aspillaga, who narrates the play in the style of Tom from The Glass Menagerie. Aspillaga is the beating heart of the play, a stand-in for the author (though the author also appears in the play). As wild as the performances by Staats, Hill, Verson, and Salem get – and they go nuts reveling in the silliness of their roles – they are brought into perspective by the VJ’s reminders that Van Halen also brought joy to a lot of people. The bio-play parts of Staats’ script are amusing, though most of the jokes didn’t land with my matinee crowd, but when the play goes quiet and speaks about the experience of fandom, about aligning life experiences with what you were listening to at the time, it stretches beyond its comedic confines and becomes something profound. It gives the rest a reason for existing.